I think the Lord works in very mysterious ways sometimes. It seems as if we finally reach a moment where things seem to be going just right, then a trial comes upon us. Have you ever wondered why? I sure have! I really believe this is true. I believe that hard times give us the opportunity to test our faith. The more we rely on God in these tough times, the more we recognize His hand and feel of His mercy and love. Our faith really does become “unshakable” as we become the benefactors of godly miracles. God knows what He is doing–He is helping us to reach our full, divine potential. He is giving us a chance to think about, turn to, and feel the grace of the atonement of Christ. He is building us to BE godly. 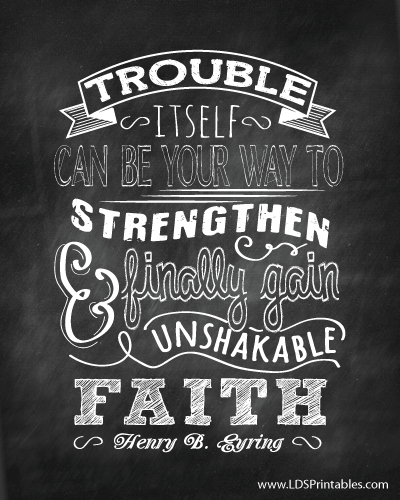 How have trials helped you to gain unshakable faith?